Notes: Dixon #30. Bar Rep. 30. Butler Vol. 4. Map 65.4 (diagram p.232). 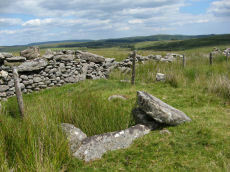 Blakey Tor (Tor South of Blackabrook). Grinsell LYDFORD 85. "A reed-filled cist is set well into the cairn on a NNW-SSE axis. The intact chamber measures internally 0.95m long, a maximum 0.65m wide and 0.45m deep; the longest side slab is 1.4m by 0.3m by 0.45m and largest end slab 0.55m by 0.2m by 0.4m. The coverstone against the NW side of the cist is roughly oval in shape and measures 1.7m by 1.3m and a maximum 0.25m thick." Lethbridge diagram p.102 Cist(B), photo p.102. Notes: Butler Blakey Tor W. - Vol. 4. Map 65.4 (diagram p.232). Grinsell LYDFORD 84. "The incomplete cist is oriented NW-SE. It measures about 0.85m long, 0.4m to 0.55m wide and 0.25m deep internally. The upright W side slab is 0.9m by 0.2m by 0.25m and the surviving end slab is 0.4m by 0.2m by 0.25m. The E side is formed by a flat-sided boulder which is c. 1.1m long, at least 0.6m thick and 0.25m high. The SE side is open. 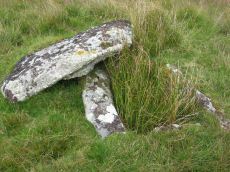 The coverstone is 1.7m by 0.7m by 0.4m and leans against the W side of the cist." Lethbridge diagram p.102 Cist(A), photo top p.103. Notes: Turner D17. Dixon #25. Bar Rep. 27. Butler Vol. 4. Map 65.2 (diagram p.229). Grinsell LYDFORD 86. 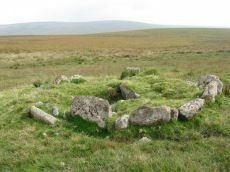 "The cairn, 7m in overall diameter and 0.3m high, has a flattish top with a retaining circle set 1m to 1.5m within the perimeter. 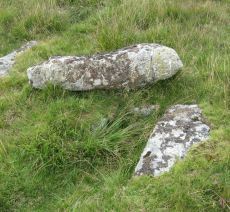 This consists of six earthfast boulders, about 0.4m across and protruding a similar height above the cairn ... A central cist is oriented NW to SE. Internally it is 0.8m long, 0.4m wide at the NW end, 0.5m at the SE, and 0.7m deep. The side slabs are 1m long and respectively 0.15m and 0.25m thick; the end slabs, 0.5m long and 0.1m thick. The capstone, moved to the W, is 1.3m long, 1.1m wide and 0.15m thick and now rests against the kerb." Lethbridge diagram p.102 Cist(C), photo p.101. Notes: Butler Royal Hill Summit Vol. 4. Map 65.2 (diagram Vol. 5. p.185). "The cairn 7.4m E to W, and 6.5m N to S, and about 0.5m high. 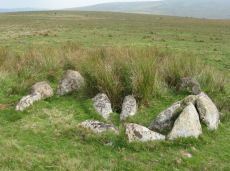 It is turf covered, but the tops of three stones of an inner retaining circle are exposed to a height of 0.3m. The largest is 1.1m long and 0.2m thick ... The cist, oriented E to W is largely infilled; internally it measures 0.8m by 0.6m, and is 0.2m deep. The coverstone is missing as is the stone at the E end. The others take the form of irregular boulders rather than slabs". Lethbridge diagram p.102 Cist(D), photo p.102. Notes: Turner E21 - listed as Royal Hill (N) [n.b. we have a south, central & north - N being a different cist]. Dixon #23. Bar Rep. 27. Butler Royal Hill E. 4 (Cairn 4 - diagram p.233) - Vol. 4. Map 65.5. Grinsell LYDFORD 89. "The cairn has an overall diameter of about 7.5m in diameter, and 0.6m high, with a flattish top. There are traces of an inner kerb 4.5m in diameter, and an outer one 5.7m across comprising boulders and slabs, the largest 1.5m long, 0.6m high, and 0.2m thick. 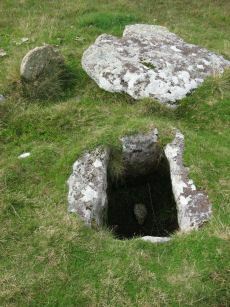 The interior of the central cist is about 0.8m square with four stones up to 0.25m thick and 0.6m deep but the southern one overlaps the sides, is 1m long, and gives the cist its NW to SE alignment. This and the two end stones incline inwards; the northern one inclines slightly outwards. There is no cover stone." Lethbridge diagram p.97 Cist B, photo p.98. Notes: Turner D21. Dixon #24. Bar Rep. 27. Butler Royal Hill E. 5 (Cairn 5 - diagram p.233)- Vol. 4. Map 65.5. Central cist. Grinsell LYDFORD 90. "The circle is 3.1m in overall diameter, comprising nine contiguous thick slabs, up to 0.9m long and from 0.3m to 0.7m high... There is virtually no cairn material but the interior has been levelled up to a height of 0.1m on the E, downhill side. 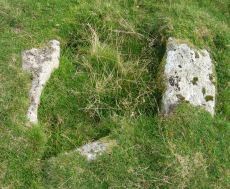 A central cist oriented WNW to ESE is represented by two side stones which protrude 0.15m above ground. They are 1.2m and 0.9m long and both about 0.2m thick and 0.4m deep. The longer, northern one leans inwards and touches the other at the W end; at the E the stones are 0.8m apart separated by two flat (packing ?) stones each about 0.35m across. 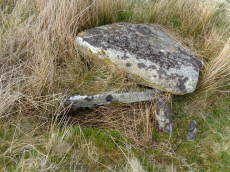 An overgrown and embedded slab against the circle W if the cist may have been an end stone." Lethbridge diagram p.97 Cist C, photo p.98. Notes: Butler Vol. 4. Map 63.5 (diagram p.215). 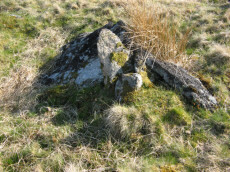 "A robbed cist within a cairn on a gently sloping NE-facing moorland hillside. 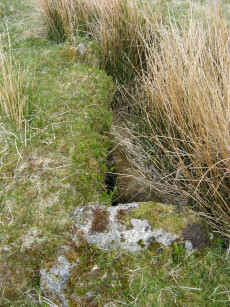 A stoney cairn 6.0m N-S by 5.5m E-W and 0.3m high contains the cist, approximately 0.8m wide, 0.3m deep and of indeterminate length and orientation. 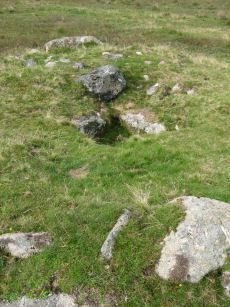 The capstone, 1.4m by 1.3m largely obscures the cist, with only the ?NE end stone being visible." Lethbridge diagram p.99 photo top of p.99.